Previous studies have revealed that tumour necrosis factor (TNF)-α is upregulated in fibrosing alveolitis (FA) in humans. The aim of this study was to compare the TNF-α secretory profile of alveolar macrophages (AMs) and peripheral blood monocytes (Mos) of patients with cryptogenic FA and systemic sclerosis (SSc), a rheumatological disorder in which lung fibrosis can occur. In particular, we wished to assess whether TNF-α levels differ between SSc patients with FA (FASSc) and a nonfibrotic group. The reverse haemolytic plaque assay was used to evaluate the secretion of cytokine at a single cell level while immunostaining allowed subtyping of AMs and Mos. This study demonstrated a difference in total TNF-α levels produced by AMs when the levels in subjects with FA (cryptogenic FA and FASSc) were compared to levels in either SSc patients without FA (P = 0.0002) or normal healthy controls (P < 0.001). In addition, AMs from patients with FASSc secreted more TNF-α than those of patients with no FA (P = 0.003). In contrast, there were no significant differences in Mo TNF-α secretion between the groups. A positive correlation was found between total TNF-α level and number of neutrophils obtained by bronchoalveolar lavage from patients with FA (r = 0.49, P < 0.04). Finally, it was demonstrated that there was significant heterogeneity of TNF-α secretion and that a numerically significant subset of mononuclear phagocytes, RFD7, was responsible for more than 80% of TNF-α production. By demonstrating the primary cell source of TNF-α in FASSc, more accurately targeted, possibly localized, anti-TNF strategies might be employed with success in the future. TNF-α is a potent proinflammatory mediator that can modulate the function and development of most nucleated cells, including those involved in chronic inflammatory lung disease [1,2,3,4,5]. A number of studies involving animal models and also human disease have demonstrated that TNF-α is upregulated in fibrosing alveolitis [6,7]. Furthermore, blockade of the effects of TNF-α with specific blocking strategies in animal models results in the prevention of inflammation and subsequent fibrosis [8,9,10]. SSc is a rheumatological disease of unknown aetiology in which lung fibrosis occurs in the majority of patients causing morbidity and increased mortality rates. Studies from our group have previously demonstrated a survival advantage for patients with FASSc by comparison with cryptogenic fibrosing alveolitis (CFA) [11,12]. We have also demonstrated differences in pathophysiology that may be relevant to the difference in survival . Previous studies of TNF-α in the context of SSc have largely focused on measurements of cytokines in serum . One previous publication has explored a variety of cytokines, including TNF-α, in bronchoalveolar lavage (BAL) fluid , but there have been no previous studies of AM and Mo secretion of the cytokines. The hypothesis on which this study was based was that TNF-α is upregulated at sites of disease in the lung by comparison with peripheral blood mononuclear cells (PBMCs). We aimed to compare TNF-α secretion from AMs from patients with CFA and FASSc; to compare secretory profiles of patients with FASSc and individuals with SSc but without FA; and to assess whether AMs and Mo from patients with FA were prone to secrete more cytokine than the nonfibrotic group in response to a non-specific mononuclear phagocyte trigger, lipopolysaccharide. In order to ensure sensitivity and specificity of our culture experiments, we have utilized the reverse haemolytic plaque (RHPA) assay, which allows single cell secretion of cytokine to be evaluated [16,17]. The technology allows cells to be studied in isolation without the stimulation of cell/cell contact and minimization of any paracrine effects from nearby cells. Sheep erythrocytes were obtained from Serotec Ltd (Oxford, UK). Recombinant protein A and endotoxin-free bovine serum albumin were from Calbiochem-Novabiochem Ltd (Nottingham, UK). Trypan blue 0.4% solution, endotoxin free poly-l-lysine (molecular weight >300,000), endotoxin-free histopaque 1077, polymyxin B sulphate, lipopolysaccharide from Escherichia coli 055:B5, glutaraldehyde (grade I; 25% aqueous solution), and levamisole were obtained from Sigma Chemical Co. Ltd (Dorset, UK). The complete media consisted of RPMI 1640 containing penicillin (100 U/ml)/streptomycin (100 Ug/ml), and 0.1% (w/v) endotoxin-free bovine serum albumin. The polyclonal rabbit antihuman TNF-α and recombinant TNF-α (specific activity = 2 × 107 U/mg) were from Genzyme Diagnostics (Cambridge, UK). The monoclonal antibodies RFD1, RFD7 and RFD9 were kindly provided by Dr LW Poulter (London, UK) and the monoclonal antibody KP1 was kindly donated by Dr DY Mason (Oxford, UK). All immunocytochemical reagents including the rabbit antimouse polyclonal antibody, mouse monoclonal alkaline phosphatase/antialkaline phosphatase (APAAP) complex, New Fuchsin substrate and control sera were from Dako Ltd (Bucks, UK). The study groups comprised 18 patients with FA (nine patients with CFA, nine patients with FASSc), 10 patients with SSc without lung fibrosis (SSc no FA), and 10 normal subjects. In the FASSc group, three patients were taking prednisolone; in the CFA group, two patients were taking prednisolone and cyclophosphamide treatment; and in the SSc no FA group one patient was on prednisolone therapy. All CFA and SSc patients underwent clinical evaluation including chest radiography, lung function measurements, and thin section (3-mm section) computed tomography assessment. Patients with SSc fulfilled the American Rheumatism Association preliminary criteria for the diagnosis of SSc . A diagnosis of pulmonary fibrosis in CFA and FASSc patients was determined by typical changes on high-resolution computed tomography  and patients with SSc were classified as FASSc or SSc no FA. Previous studies from our group and others have confirmed the specificity and sensitivity of high-resolution computed tomography in the diagnosis of FA [20,21,22]. The normal subjects studied included one current smoker and an ex-smoker, who had stopped smoking 7 years before lavage. All normal subjects had no evidence of pulmonary disease. The Royal Brompton Ethics Committee gave approval for the BAL of the normal volunteers. Details of all subjects are summarized in Table 1. CFA = cryptogenic fibrosing alveolitis; Eosin = eosinophils; EX = ex-smoker, stopped at least 12 months; F = female; FASSc = fibrosing alveolitis associated with systemic sclerosis; Lymph = lymphocytes; M = male; Macr = macrophages; Neutr = neutrophils; NS = nonsmoker; S = current smoker; SSc = systemic sclerosis. Fibreoptic bronchoscopy and BAL were performed using a standardized technique. Briefly, 5 × 20 ml aliquots of prewarmed normal saline were instilled into three subsegmental bronchus of right middle lobe, right lower lobe and lingula, and aspirated immediately by gentle suction. The cells (macrophages, lymphocytes, neutrophils and eosinophils) were separated from the lavage fluid by centrifugation at 200 g, 4°C for 7 min and washed twice in RPMI 1640 media containing antibiotics. Cellular concentrations and recoveries were estimated using crystal violet staining and cellular viability measured using trypan blue exclusion. Following cytocentrifuge preparations (Cytospin-2; Shandon Southern Instruments, Sewickly, PA, USA), the remainder of the cells were pelleted and resuspended in complete media, at a count of 1 × 106 cells/ml for use in the RHPA. Differential cell counts were performed on 200 May-Grunwald-Giemsa stained cells. The BAL cell details are summarized in Table 1. Twenty millilitres of peripheral venous blood was collected into heparinized containers and PBMCs were isolated on an endotoxin-free Histopaque 1077 gradient using the method of Boyum . The PBMCs were washed three times and resuspended at a final concentration of 2 × 106 cells/ml in complete media, for use in the RHPA. The assay was performed as previously described [16,17]. In brief, confluent monolayers of protein-A-coated sheep red blood cells (RBCs) and BAL or autologous PBMC cells from each individual were cultured in 30 μl chambers for 12 h, 37°C, 5% CO2 with complete media containing 1/50 dilution of rabbit antihuman TNF-α polyclonal antibody alone or with 10 μg/ml lipopolysaccharide. TNF-α secretion by individual mononuclear phagocytes was visualized as clear plaques of lysed TNF-α/anti-TNF-α-associated sheep RBCs around the TNF-α-secreting cells using 1/30 dilution of guinea-pig serum as the source of complement (Gibco, Uxbridge, UK). The viability of the BAL and PBMC cells was evaluated using trypan blue exclusion and of TNF-α-secreting cells identified by immunocytochemistry. To confirm that plaque formation was specific for TNF-α secretion by individual cells we omitted BAL and PBMC cells from the assay; replaced the anti-TNF-α antibody with 1:50 normal sheep serum; omitted the complement; used uncoated sRBCs; and preabsorbed the antibody at 4°C overnight with 1 μg/ml recombinant TNF-α. Endotoxin contamination was excluded by assaying secretion in the presence of 5 μg/ml endotoxin inhibitor polymyxin B sulphate. Preliminary time course cultures of PBMC were performed for 3, 6, 8, 12 and 24 h on two different occasions in order to optimize the culture conditions with respect to easily identifiable haemolytic plaques and cellular viability. AMs and Mo were identified following the RHPA by immunolabelling with KP1 mouse monoclonal antibody . Briefly, the monolayers were fixed with 1% glutaraldehyde for 30s and permeabilized using TBS pH 7.4. Visualization of the KP1-identifiable mononuclear phagocytes was achieved by immunostaining with APAAP  together with new fuchsin substrate system, containing 5 mmol/l levamisole, and haematoxylin counterstaining. Subsets of AMs were identified using the monoclonal antibodies RFD1, RFD7 (available from Serotec, Oxford, UK) and RFD9 (a kind gift from Professor LW Poulter, Royal Free Hospital) . For monoclonal antibodies RFD1 and RFD9, cell monolayers were incubated with 1/5 dilution antibody in complete media at room temperature for 30 min, washed with complete media and fixed with 0.2% glutaraldehyde in phosphate-buffered saline for 5 min, treated with 50 mmol/l glycine in phosphate-buffered saline for 10 min followed by APAAP staining. For the RFD7 monoclonal antibody the monolayers were fixed in 4% paraformaldehyde/7% sucrose for 10 min, treated with 50 mmol/l glycine for 10 min, and permeabilized as for KP1. Incubation with 1/5 dilution RFD7 monoclonal antibody was followed by APAAP staining as described. As a control for antibody specificity, either the primary monoclonal antibody was replaced with mouse IgG1 negative control or the secondary rabbit antimouse IgG was replaced with normal rabbit serum. The slides were counted at 400× magnification and 100 AMs per slide were counted. Plaque areas of sRBC lysis around individual TNF-α-secreting cells were measured using Leitz microscopy with Apple Macintosh computer and image analysis package (Improvision, UK). For each assay condition 25 lysed plaque areas in each of three replicate chambers were measured. The area occupied by the TNF-α-secreting cells was subtracted from the each plaque area. Only BAL cells and PBMC samples with a viability of 87% or more were used in the RHPA. The average TNF-α plaque area per cell and percentage of TNF-α-secreting cells were calculated for each chamber and the average of the triplicate samples obtained. A total plaque area per 100 Mo/AMs was calculated (total plaque area = average plaque area (μm2) × percentage of TNF-α-secreting cells) for each of the triplicate chambers per condition and the total plaque area for each condition was expressed as the average of the triplicate measurements. The following criteria were applied when measuring plaque area and percentage of plaque forming cells: lysis of sRBC around the plaque forming cell had to be visible and well defined; plaque measurement was performed on randomly selected nonoverlapping microscope fields; only plaques formed by single cells were counted; clusters of Mo/AMs were not included in the counting; and plaque counting was performed 'blind', without knowledge of the cell source in the chambers. Group data were distributed nonparametrically and comparisons between groups were made using the Kruskal-Wallis test for multiple group comparisons followed by the Mann-Whitney U test for comparisons between two groups. Correlations were calculated using Spearman's rank test. P < 0.05 was considered statistically significant. Preliminary time course experiments using PBMCs showed that haemolytic plaque formation was first evident at 6 h. More easily identifiable plaques of sRBC lysis formed by TNF-α-secreting Mo were seen after 12 h incubation and the viability of the PBMC cells at the end of the culture period was >93%. At 24 h, larger haemolytic plaques were seen but cellular viability was reduced to <70%. For subsequent experiments, therefore, cultures were continued for 12 h and cellular viability monitored. Plaque formation was specific for TNF-α secretion because no plaques were seen when the antibody was replaced with normal sheep serum, the complement was omitted, uncoated sRBC were used, or the antibody was preabsorbed with recombinant TNF-α. KP1 immunostaining for mononuclear phagocytes confirmed that all plaque-forming cells were Mo or AMs. In order to assess whether there is increased TNF-α production and secretion by individual mononuclear phagocytes in subjects with FA we assessed the average levels of TNF-α secretion by Mo and AMs from subjects with FA and compared these with cells obtained from patients with SSc without fibrosis, and normal individuals. We observed that there was a significant difference between the groups in the average levels of TNF-α secretion by AMs (P = 0.011) but not Mo (Table 2). Specifically, AMs from patients with FA produced more TNF-α than subjects with SSc no FA (P = 0.008) and normal individuals (P = 0.009). There was no difference between CFA and FASSc. In SSc, no significant difference in average TNF-α level was found between those with or without FA. Lipopolysaccharide stimulation resulted in an increase in the average levels of TNF-α secretion per cell by Mo and AMs from all groups of subjects examined. There remained no differences in secretion by Mo between the groups. The differential between the AM groups remained, although at a higher level of secretion. Paired analysis showed that AMs consistently secreted more TNF-α than autologous Mo both spontaneously and after lipopolysaccharide stimulation. AM = alveolar macrophages; APA = average plaque area; FA = fibrosing alveolitis; LPS = lipopolysaccharide; Mo = peripheral blood monocytes; %PFC = percentage of plaque forming cells; SSc = systemic sclerosis; TPA = Total plaque area. In order to assess whether TNF-α was a constitutive product of all or only a subset of mononuclear phagocytes, we used the RHPA to enumerate the numbers of TNF-α-secreting cells and the levels of secretion by individual cells. Interestingly, we observed that the secretion of TNF-α by Mo and AMs is heterogeneous and that not all Mo and AMs secrete TNF-α. Furthermore, of the Mo and AMs that secrete TNF-α, the levels of TNF-α secretion varied considerably between cells. Fig. 1 illustrates the variation in the levels of TNF-α secretion by mononuclear phagocytes from a patient with FASSc in a single RHPA. Plaques of sRBC lysis formed by Mo and AMs spontaneously secreting TNF-α over 12-h culture in the RHPA were grouped according to plaque size, and Fig. 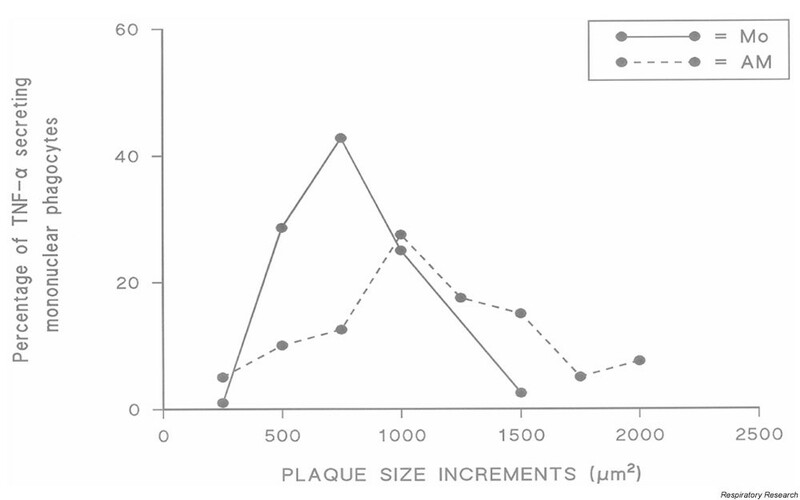 1 shows the frequency distribution of these plaque sizes. The range of plaque sizes produced by Mo was more compact than those produced by autologous AMs. In this regard, 7% of AMs produced plaques >1500 μm2 area whereas no Mo produced a plaque larger than 1500 μm2. Similar results were obtained with Mo and AMs from subjects with CFA, SSc no FA, and normal individuals (data not shown). Heterogeneity of tumour necrosis factor (TNF)-α secretion by individual mononuclear phagocytes from a patient with systemic sclerosis. Haemolytic plaques obtained after a 12-h culture were assigned to size groupings. Shown are frequency distributions of the percentages of cells with plaques of different areas. AM = alveolar macrophages; Mo = monocytes. In order to quantify the functional heterogeneity of mononuclear phagocytic TNF-α secretion, the percentages of Mo and AMs secreting TNF-α either spontaneously or after lipopolysaccharide stimulation were evaluated for all study groups. 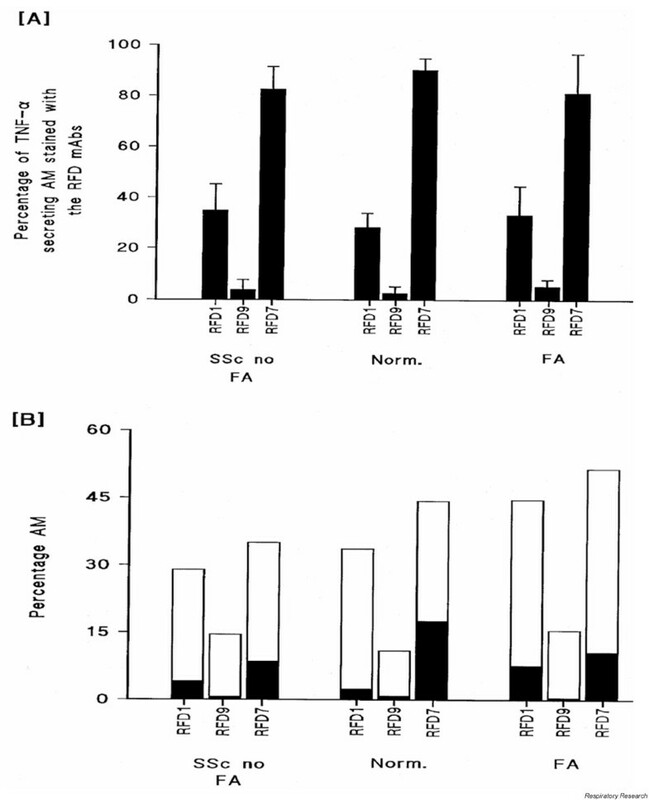 A striking difference was observed between the percentages of AMs from subjects with FA that secreted TNF-α, and the percentages seen with cells from subjects with SSc no FA (spontaneous P = 0.007; lipopolysaccharide P = 0.0014) or normal individuals (spontaneous P = 0.0011; lipopolysaccharide P = 0.0012). No differences were seen between CFA and FASSc but patients with SSc and fibrosis were significantly different from the group with SSc but without fibrosis (P = 0.007, spontaneous; P = 0.005 after lipopolysaccharide). There were no significant differences in monocyte numbers secreting either spontaneously or after lipopolysaccharide stimulation across the groups, and consistently more macrophages were secretors by comparison with autologous monocytes (P < 0.002). Total amounts of TNF-α secretion by populations of mononuclear phagocytes is dependent on the sum of the levels of secretion per cell and the number of Mo and AMs secreting TNF-α. In order to evaluate the total levels of TNF-α secretion by these two cell populations we calculated the product of the average levels of TNF-α secretion per cell and the percentage of TNF-α-secreting mononuclear phagocytes. In patients with FA the spontaneous total TNF-α secretion by AMs was significantly higher than in patients with SSc no FA (P = 0.0002), and normal individuals (P < 0.001; Table 2). In this regard, the median total TNF-α secretion by AMs from patients with FA was greater than AMs from the other groups. No differences were seen between CFA and FASSc. AM from patients with FASSc secreted more TNF-α than patients with no FA (P = 0.003). The total spontaneous TNF-α secretion by Mo was not significantly different between the groups. Stimulation with lipopolysaccharide resulted in upregulation of the total secretion of TNF-α by AMs and Mo in all groups. On average, Mo secretion increased by 112% for the nonfibrotic groups and 141% for FA. Similarly AM secretion was increased by 62–80% for the nonfibrotic groups and 46% for FA. AMs from patients with FA secreted significantly more TNF-α than those from patients with SSc no FA (P = 0.0012) and normal individuals (P = 0.001; results not shown). We did not observe any significant difference between the groups in the levels of total TNF-α secretion by lipopolysaccharide stimulated Mo. To show that in vitro TNF-α synthesis and secretion was likely a true reflection of events in vivo, the relationship between the total levels of spontaneously secreted TNF-α and neutrophils obtained by BAL from patients with FA was quantified. A correlation (r = 0.49; P < 0.04) was found, suggesting that one of the consequences of AM TNF-α secretion is neutrophil influx into the lungs of patients with FA. However, other mediators may also be involved in neutrophil chemotaxis. Having established that there is heterogeneity in the secretion of TNF-α by mononuclear phagocytes and that in subjects with FA there is an increase in the percentage of TNF-α-secreting AMs, we set out to characterize the phenotype of the TNF-α-secreting AMs. We evaluated the phenotype of the TNF-α-secreting AMs from subjects with FA, SSc no FA and normals, by cell size and by using the monoclonal antibodies RFD1, RFD7 and RFD9 following culture in the RHPA. Production was proportional to cell diameter for AMs (r = 0.66; P < 0.001) but not for Mo (r = 0.1; P = 0.63). AMs from sixpatients with FA (CFA, n = 4; FASSc, n = 2), three patients with SSc no FA and three normal individuals were evaluated using the RFD panel of monoclonal antibodies. All subjects underwent staining for all the subsets. Of the TNF-α-secreting AMs, the largest subset was that recognized by the monoclonal antibody RFD7 (FA, 81.3 ± 15.4%; SSc no FA, 82.7 ± 8.8%; normals, 90.4 ± 4.4%; mean ± SEM), whereas lower percentages expressed the ligands identified by the monoclonal antibodies RFD1 and RFD9 (Fig. 2A). We observed that only a minority of AMs that were identified by the RFD monoclonal antibodies secreted TNF-α (Fig. 2B). In this regard, for all populations studied, TNF-α was secreted by, on average, 28 ± 5.3% of the RFD7-positive cells, 5.1 ± 1.1% of the RFD9-positive cells, and 13.2 ± 3.9% of the RFD1-positive cells. The total percentages of AMs that were identified by these monoclonal antibodies was greater than 100% in the FA group, indicating that there is a population of AMs expressing more than one epitope. Immunophenotyping of tumour necrosis factor (TNF)-α-secreting alveolar macrophages (AMs). (A) Shown are the percentages of tumour necrosis factor-α-secreting AMs from patients with systemic sclerosis (SSc) without fibrosing alveolitis (FA), patients with FA and normal individuals (Norm) that were identified by the monoclonal antibodies (mAbs) RFD1, RFD7 and RFD9 (the data are presented as means ± SEM). (B) Shown are the average absolute percentages of AMs from each subject group identified by the mAbs RFD1, RFD7 and RFD9. The solid areas under each bar represent the percentage of each RFD-identified AM population that was secreting TNF-α. This study has demonstrated that AMs from patients with FA secrete more TNF-α per cell than patients with SSc without FA and normal individuals. We further demonstrated that the percentages of cells secreting TNF-α is higher in FA than in the other groups, and thus the total TNF secretion is significantly higher in FA. In contrast, there are no differences in secretion between the groups' peripheral blood monocytes. The difference in TNF-α production between AMs and peripheral blood monocytes probably reflects monocyte maturation and localised activation. Lipopolysaccharide stimulation generally upregu-lated secretion in all groups, maintaining the differential between the groups. We demonstrated no difference between cells obtained from patients with CFA and those with FASSc, but differences between FASSc and SSc no FA were similar to those seen in comparisons of the FA group as a whole with the non-FA group. Furthermore, the TNF values for those receiving treatment did not demonstrate a skewed distribution when compared with the other populations (data not included). Finally, we demonstrated that there were significant heterogeneity of TNF-α secretion and that a specific subset of mononuclear phagocytes, RFD7, was responsible for more than 80% of TNF production. This study differs from previous studies in SSc by demonstrating a specific subset of AMs responsible for the bulk of local TNF production. Studies looking at BAL fluid do not have the power to identify the cell source of TNF-α production and by doing so we open up an opportunity for much more specific targeting of anti-TNF-α approaches. The use of monoclonal antibodies in rheumatoid arthritis has been successful in minimising human chronic inflammatory disease [27,28]. By demonstrating the primary cell source of TNF-α in FASSc, more targeted, possibly local, anti-TNF strategies might be employed with success in the future. The study has shown clearly that it is only when mononuclear phagocytes have matured in the lung into tissue-type AMs that an enhanced TNF-α secretion occurs. The trigger for this upregulation is unknown, although, in previous studies, we have demonstrated that AMs from patients with FASSc and CFA secrete enhanced amounts of interleukin-8, a known TNF-α upregulator in addition to its chemokine functions . Equally possible is that the primary trigger for FASSc, at present unknown, directly stimulates mononuclear phagocytes in the local microenvironment. The advantages of using the RHPA over more traditional culture methodologies are multiple. Firstly, cells can be studied in isolation which removes the potential confounding affects of cell/cell contact and minimizes, because of the small (30–40 μl culture chamber volume) paracrine effects. Secondly, the identity of the subset of cells producing TNF-α can be established after the culture period. Thirdly, by specific blocking experiments we can confirm conclusively that the effects are due to TNF-α. Consistent with the increased sensitivity and specificity of this technique, we have previously demonstrated an enhanced secretion of interleukin-8 by AMs from patients with FA . In that study, by contrast with this study, autologous PBMCs secreted enhanced amounts of interleukin-8 by comparison with AMs. It was only in the FA group that enhanced interleukin-8 production was seen from AMs. Furthermore, in the interleukin-8 study, we showed that the enhanced secretion was exclusively due to an increase in the percentage of AMs secreting interleukin-8 and that the cell source was the less mature monocytoid AMs. Enhanced TNF-α secretion has been demonstrated in this study to be due to a combination of increased average amounts of product from each cell as well as an increase in the numbers of cells secreting TNF-α. This is an additional advantage of this technology, demonstrating stimulation of cells already secreting TNF-α as well as recruitment of new TNF-α secretors. In more traditional culture environments, much larger numbers of cells are needed, they are often in cell/cell contact, and the conditioned medium contains a 'soup' of other cytokines that have variable regulatory effects on the cells of interest. However, in vivo, it is likely that very small amounts of cytokine operate in tight microenvironmental conditions. The alternative is that the unfettered actions of cytokines will cause more host damage than host defence modulation. The RHPA closely reproduces these conditions, providing more realistic information than previous techniques on events in the local environment. One criticism of this study is that the results of the immunophenotyping are limited by the small number of subjects studied (CFA, n = 4; FASSc, n = 2; SSc no FA, n = 3; normal, n = 3). At the time of the study, the complexity of the technique and the post-RHPA treatment required for immunostaining with the RFD antibody panel meant that only some of the slides available were suitable for subpopulation analysis. However, the RFD monoclonal antibodies identified proportionately the same percentage of cells in all 12 patients irrespective of group, and in all individuals the TNF-α secreting cells were stained with RFD7 monoclonal antibody. It would appear, therefore, that there are no significant subpopulation differences with regard to TNF-α secretion across the groups and that a number of 12 is an acceptable cohort. This is similar to our findings with regard to interleukin-8 secretion . TNF-α remains a crucial cytokine in inflammatory responses. Involved in defence against microbes and other foreign agents, there is also little doubt that enhanced TNF-α secretion is responsible for releasing a cascade of subsequent mediator secretion resulting in chronic, persistent inflammation, lung injury and subsequent fibrosis . Targeted approaches to therapy in the future will necessitate the identification of key cytokines that operate early in the pathophysiology of a disease to make more logical specific targeting approaches. TNF-α has been demonstrated previously to be such a cytokine . Zhang et al. showed in a series of animal experiments that blockade of TNF-α, either before or after the triggering of fibrosis, abrogates subsequent chronic inflammation and fibrosis. In this study we have demonstrated that TNF-α is upregulated specifically in the lungs of patients with FASSc and that a single subset of macrophages is responsible for the bulk of the secretion. In conclusion, we suggest that this may indicate a role for specific TNF-α blockade as a therapeutic strategy in the FA of SSc. The authors are grateful to Dr LW Poulter for the mAb RFD1, RFD9 and RFD7. The Sir Jules Thorn Trust supported this work.